Are you tired of the same old dinner? Bring a new taste to the table with the NewWave 30 pieces cutlery set. The NewWave 30 pieces cutlery set originates from the style and the pursuit of the highest quality of Villeroy & Boch, a brand that for over two centuries has been reinventing the tradition of European craftsmanship, through a concept that combines the classic roots with a new modern feeling. This cutlery set expresses itself through clean and linear lines in a way that is complementary to the Art of the table collection, which includes the most refined items for the kitchen and the table. 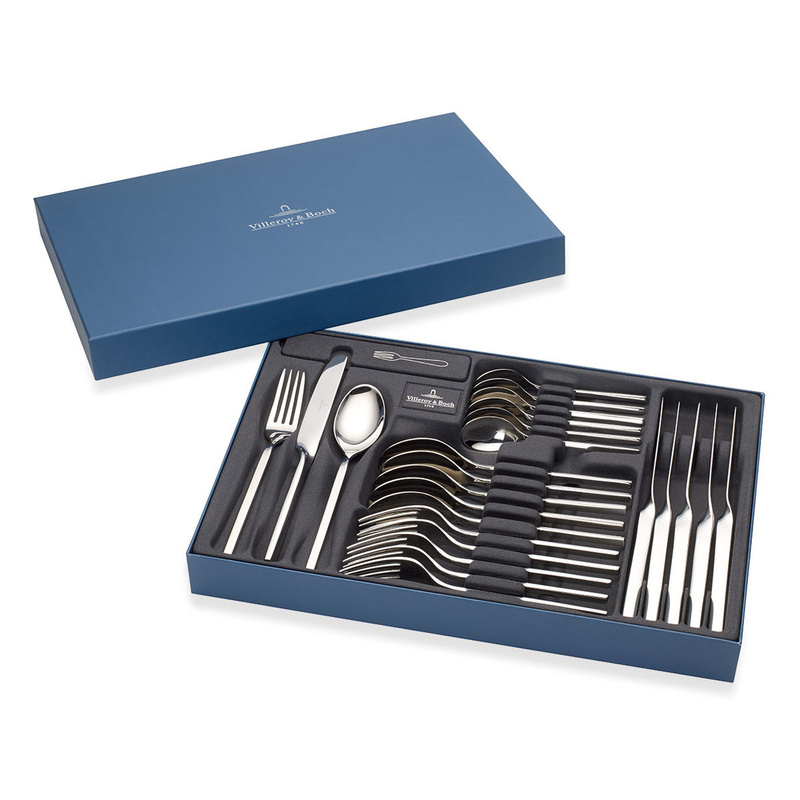 The cutlery set of the NewWave collection is contained in a very elegant box and it is composed of 30 pieces: 6 spoons, 6 forks and 6 knives, all in standard size. The collection is completed by 6 teaspoons and 6 dessert forks with the same style. Each piece of the set embodies the highest refinement of taste and practicality. The whole set is made of stainless steel which, as known, is an excellent quality material that guarantees the highest resistance to external agents. The NewWave cutlery set by Villeroy and Boch well matches any kind of crockery on the table and is suitable for daily use or for the most formal occasions, when there you need to add an extra touch of refinement and good taste to the table. The sobriety of the lines and shapes of this particular collection, make it really suitable for any situation. The high quality of the components, in addition, makes the cutlery dishwasher safe without any risk for the particular gloss of the surface, even after numerous washes at high temperatures. Steel is also a very hygienic element because, thanks to the smooth surface, it prevents the adherence of the bacteria. The NewWave 24 pieces cutlery set by Villeroy and Boch is the perfect gift to give to yourself or to others, an elegant and very valuable object, also perfect as an elegant and original wedding gift.